The XTERRA Fitness TR150 Treadmill combines the quality and performance you desire with the flexibility of a machine that can be easily folded up and stored away. 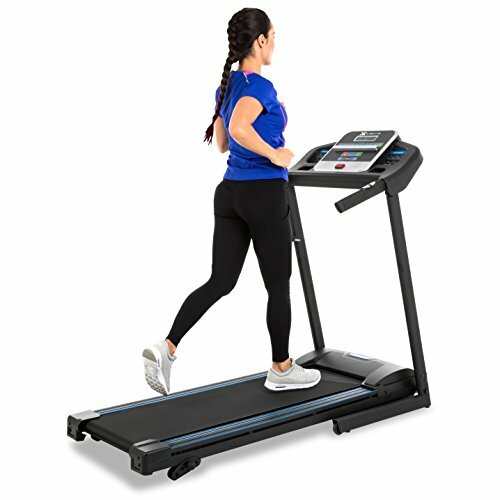 Specifically designed for the home environment, the TR150 incorporates numerous thoughtful features that were developed with your performance and comfort in mind.In a nutshell, the XTERRA treadmills are ideal for a fitness minded individual who wants a durable, attractive piece of equipment that will prove to be reliable in the long run. These treadmills are known for their longevity, look, and feel, making this model a perfect candidate for almost anyone looking for a dependable treadmill that will last for years to come. The XTERRA TR150 is admittedly a little pricey but for entry level treadmills, it is a pretty good option to purchase especially considering that its price and features pair it up with the wildly popular Weslo G 5.9 Cadence treadmill. In fact, the TR150 model costs less than the Weslo. And while we love the Weslo as an entry level treadmill, we strongly suggest that if you’re looking for a model that gives the same features for a lesser price, your money on XTERRA’s budget friendly treadmill would not go wasted. The console was designed for ease of use while still providing you with all the features you deserve. A large 5” LCD provides you with important workout feedback while the intuitive button layout incorporates Direct access speed buttons for quick access of your favorite speeds – great for interval training! The integrated bookrack and accessory holders keep your reading material, remote control, and anything else you want close by, right where you need it. And to help keep you in your training zone, hand grip pulse sensors are conveniently mounted on the side handlebars.